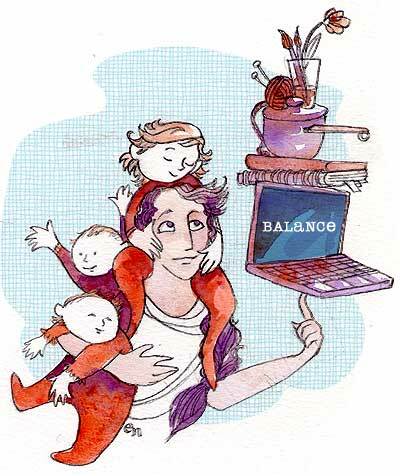 Illustration Friday: Balance (keep going, there are two this week) My life is all about balance. I don't like to call it that; I would rather call it everything working in harmony because balance sounds to me like too much of a juggling act. Which, believe me, it is anyway. I seem to have learned how to have quality time for my family, working, cooking healthy meals for the week, and creative time (without which I would, definitely and beyond a shadow of a doubt, curl up and die). I learned the hard way, but it's ingrained now. The Lord of Green Well, I did my original painting, and then I read this marvelous blog entry from A Cup Of Rich... he notes that a calendar he has equates green with balance. "I could use a lot of that peace, balance, harmony, and restoration right now. 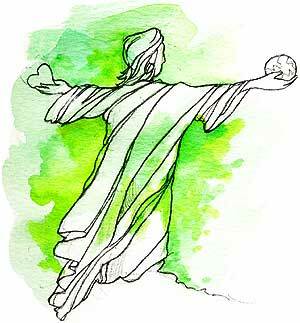 And if green is all those things, then Jesus is the Lord of Green." God, I love that! The entry says it 9 gazillion times better than I do... please check it out (it's been inspiring me all week!) ....................................... Two days left in the auction! 100% of the profits go to UNICEF to benefit the tsunami victims.